MANILA, Philippines - A tempting link is going viral on social media Tuesday night masquerading as a free Pizza Hut Double Trouble coupon for someone who will get 15 points for sharing and unlocking the coupon. Tagged as 'Pizza Hut Halloween' treat, netizens are now asking if it's real or hoax? 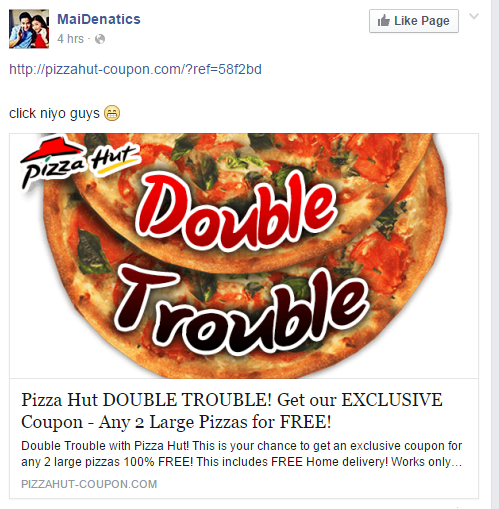 The link from pizzahut-coupon website which is popping specially on Facebook, says "Double Trouble with Pizza Hut! This is your chance to get an exclusive coupon for any 2 large pizzas 100% FREE! This includes FREE Home delivery! Works only on Phone & Online orders." When clicked, the link takes user to a webpage which instructs them on how to get the coupon. "This is your invite link. Share it with your friends, colleagues and family," it reads. "Every time someone clicks on your invite link you wil get 1 point. Earn 15 points and you will unlock your unique Double Trouble Coupon," the instruction says. The page also displays a counter which says the number of left coupons. However, upon checking, the counter seems to be not consistent after reload of stats hinting it's fake. The 'Get Coupon' box at the bottom of the page obstructs the disclaimer that the website is not associated with Pizza Hut restaurant chain in any way. Checking on the pizza company official website in the Philippines, the alleged Halloween treat is nowhere to be found on their promo list. Real latest promo of Pizza Hut circulating on emails is for SM Advantage cardholders, a free treat if they dine-in in their selected outlet from Oct 1- Dec31, 2015. UPDATE: On Friday, Pizza Hut made an official statement on the alleged 'Double Trouble' Promo. This is not the first time Pizza Hut scam is making its way around Facebook. In 2011, fake pizza coupon went viral in time for the chain's supposed 55th anniversary. The "Get Free Pizza Coupon" button when clicked will install malware on computer.